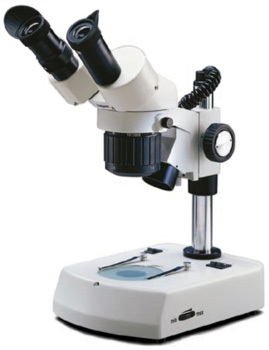 The convenience and versatility of viewing large pictures at 10x magnification, then zooming continuously all the way to close-up detail at 40x magnification. Upright, unreversed 3-dimensional image remains in focus throughout zoom range. Features top light with directional beam, bottom light with cool, long-life fluorescent illumination. 420T includes SLR adapter and video adapter. 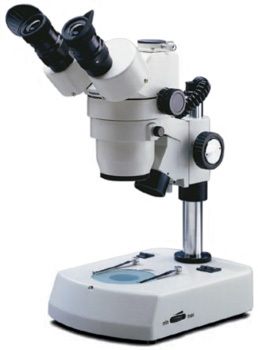 * When using optional 0.5x objective lens on 420-1107 and 420T-1107, maximum specimen height can be increased to 133mm by using optional M-1110 auxiliary post (350mm tall). Available with 110v or 220v (220v is CE approved and supplied with European plug). To order 220v, add -220V to end of model number. Tension adjustment eliminates focus "drift". Heavy-duty post mount with locking support collar which permits up or down adjustment of viewing head to accommodate different sized objects on stage. (Supplied) (Accepts Reticle) 23mm O.D. Combines the precise optical performance of our most popular stereo model with a newly enhanced illumination system. Specially designed incidental lamp can be directed precisely where needed, includes intensity control. Transmitted illumination is fluorescent for optimum light and very cool temperature to prolong life of live material. Eyepiece equipped with reticle holder/retainer to accept reticle with 23mm O.D. Viewing head rotates 360°, adjusts up or down on post mount to accommodate different size specimen. Molded styrofoam container with instruction brochure, vinyl dustcover & rubber eye shields. Lifetime limited warranty, excluding bulb and fuse. 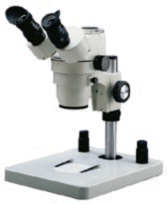 All the quality features and versatility of larger stereo microscopes, in a compact size that is more efficient for many uses. 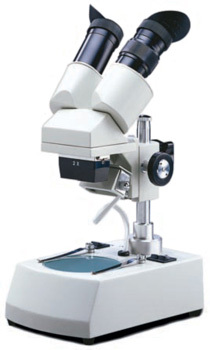 Choose low or high magnification simply by turning the objective turret. 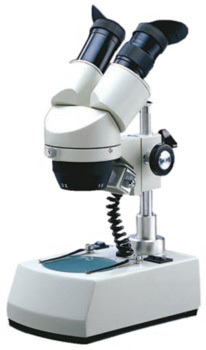 Viewing head is 45 degrees inclined and rotates 360 degrees so that user can position microscope conveniently in forward or reverse viewing position. Post mount permits head to be adjusted up or down to accommodate larger objects on stage. Note: To order with 220v electrical system, add -220V to end of model number. Paired widefield eyepieces with diopter adjustment on left side. Interpupillary adjustment from 55mm to 75mm. Reticle holder/retainer accepts eyepiece reticle with 23mm O.D. Height: 12-1/4 in. (310mm) extends to 14-3/4 in. (370mm) for larger objects. Lifetime limited warranty, excluding bulbs & fuses. 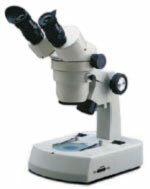 Same high quality optical system and precise mechanical components of the larger stereo microscopes. Upright, unreversed image. Available with 2x, 3x, or 4x objectives for different magnifications. 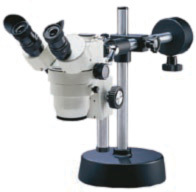 Optional eyepieces may be added later for increased magnification (20x is considered ideal for inclined, post mounted to permit 360° rotation and adjustment up/down to accommodate larger specimens. 45° inclined, with diopter adjustment . Interpupillary adjustment from 50mm to 75mm. Reticle holder/retainer accepts eyepiece reticle with 23mm O.D. High intensity 12v 10 watt incidental and transmitted illumination. Separate switches permit use of top & bottom, top only or bottom only. Mounted on metal post, adjusts up and down. Molded styrofoam container with instruction brochure, eye shields and vinyl dust cover. 5-year limited warranty excluding bulb and fuse.